For small businesses looking to get more done outside of the office, the new ZTE Axon M could be a critical innovation. It comes with two 5.2 inch displays. When fully open, the device actually turns into a small tablet. This phone can remove the strain of working on a small screen by taking advantage of both displays. When it is folded, the Axon M looks like a standard smartphone and it pretty much has the same features. The transformation takes place when you unfold the back and it lights up to reveal a second screen of the same size. With more people using their smartphone as their primary computing device, providing more screen real estate means being able to do more. And Axon M has many Android/Google driven apps that take advantage of both screens to run multiple apps separately on each screen or a single app on both. Smartphones have personal and business use and they have to evolve to keep up with how the technology is being used. Lixin Cheng, CEO of ZTE Mobile Devices (SHE:000063), touched on this point in a press release announcing the new device. He said, “The mobile technology ecosystem and consumer habits have evolved over the past several years, but the smartphone experience has only slightly varied throughout that time until today, with the introduction of the Axon M,” Cheng said. Dan Seiffert of the Verge gives a first look in this video. The Axon M comes with two 5.2-inch screens at 1,920×1,080 pixels each and a 2.15 GHz quad-core Qualcomm Snapdragon 821 processor. You get 64GB of storage expandable to 256GB, and 4GB of RAM powered by a 3,180mAh battery. A single 20M camera is used to capture selfies, regular photographs and 4K video. Besides the obvious entertainment value of the Axon M, ZTE wants the phone to improve productivity apps. The company has optimized Google Docs, Sheets, Slides, Photos, Chrome, Maps, Gmail, Facebook, Twitter, Firefox and others along with a total of 80 of the 100 most commonly used apps. These optimized apps work seamlessly to display the content by taking into account the gap that exists between the screens. So when you are running a spreadsheet or presentation, you won’t lose any of the data. The company has created Dual, Extended, Mirror and Traditional modes to make use of both displays so they can work in tandem or individually. According to ZTE, the Axon M is going to be available in the US exclusively through AT&T in the next month. Although the price hasn’t been announced, the press release says you can get one for $24.17 per month for 30 months, which comes out to $725. The Axon M has great potential, and for small businesses that spend most of their time outside of the office, the secondary screen and the functionality it provides could be the deciding factor to making the purchase. Plenty of gurus promise proven systems for raking in cash. The problem is that most gurus don’t actually produce real results. In 2014, The Oracles member Josh Harris found himself shivering under blankets and scraping the bottom of his bank account during one of Michigan’s coldest winters on record. He could barely afford to turn the heat on because he was desperately trying—and failing—to scale his small digital marketing agency. No matter what he did, it never seemed to scale the business and he was only collecting small fees from demanding clients. “Eventually, I realized I was settling for ‘good enough’ instead of pushing myself for more and I knew that I needed to commit fully to my success,” Harris says. Back against the wall, he dumped his old playbook, which consisted of cold calling prospects and working on a per-project basis with local clients. He started using different online channels to find, qualify, and sell to high-ticket clients across the country. And his results were stunning. Within a few months, he scaled to a $40,000 predictable monthly revenue. Today, Harris earns more than $2 million per year. Harris recalls that friends and associates started begging him for advice. Through teaching, he quickly realized that he’d “cracked the code” on how to build a lucrative six-figure marketing agency from scratch. One student replaced his entire solid income from a state government job within two months. Another, laid off, pushing age 60, and a complete unknown in the market, now makes nearly $40,000 per month. Build a six-figure marketing agency in five steps. 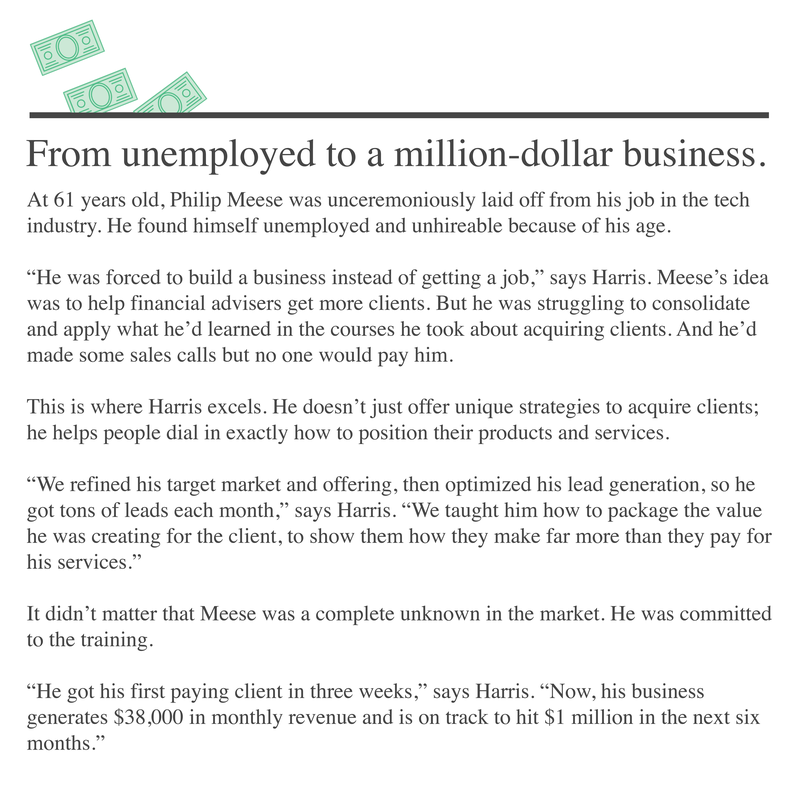 Harris’s coaching, which today provides the bulk of his income, helps select students build a location-independent marketing agency from scratch over two months, while working full time. 1. Help your clients make money. Harris advocates focusing on high-value service offerings that companies need and will impact their bottom line. Lead generation is the big one. Being able to generate new revenue for companies is an easy sell: you can prove ROI immediately and charge a premium. Harris says Facebook ads, Google AdWords, and LinkedIn services are particularly potent. He teaches students how to package these offerings to clients, then produce results by partnering with service providers in these spaces, and he helps his students develop a steady pipeline of interested prospects. He also helps his students incorporate machine learning and Artificial Intelligence to dramatically increase conversions for clients by only targeting people who have qualified themselves through multiple digital behaviors. That means students aren’t wasting time and money on prospects who are never going to buy. 2. Pick the right niche. “Lots of people are very smart but pick markets they’re destined to fail in,” Harris cautions. He recommends finding niches with high-ticket sales (think thousands of dollars). In premium markets, you only need to generate a few quality leads for businesses to prove value. He also recommends picking niches with a short sales cycle. If it takes a year for a company to start making money with your services, you’ll run into trouble quick. That’s one reason Harris says he doesn’t advise students to offer SEO services—they take too long to produce results. Facebook ads, Google AdWords, and LinkedIn, however, can generate clients immediately. 3. Build a predictable pipeline. “Most people wait until they need a pipeline, but by then, it’s usually too late,” Harris warns. His students use LinkedIn outreach to build pipelines before they need them. Too many marketers don’t use LinkedIn or waste time and money on other methods, such as paid ads or cold emails, to secure their initial clients, he says. Harris recommends turning your profile into a landing page targeted at your niche. Then, begin connecting with the decision-makers in your niche. “Don’t be afraid to leverage common connections and send connection requests introducing yourself and what you do. With this alone, you’ll be doing more than 99 percent of digital marketers do,” Harris says. Image credit: Josh Harris presenting at an exclusive mastermind. 4. Sell nationally, and specifically, not locally. “Local clients are not ideal,” Harris advises. Their expectations are typically extremely high, and sales cycles take a long time—thanks to plenty of in-person meetings. Taking on local clients also restricts you to a single location. “Remote clients tend to bother you a lot less. For a time-efficient, scalable business, prospect outside your local market via phone sales,” he says. Harris recommends letting clients talk, rather than pitching them immediately. Ask targeted questions about their marketing goals. For example: “How are you currently getting new customers?” and “How does your sales process work?” Let their answers guide the conversation. When you ask questions, you create trust. Finally, make an offer. At this point, most people sense whether or not you can help them. Instead of sending a proposal, then waiting to hear back, offer your standard package if the client seems like a good fit. “I’ve found that if people are convinced you can’t help them, rarely will a proposal change their mind,” Harris says. “The ones who want to go big and fast find a mentor,” Harris says. Finding people who know how to accelerate success saves you time and money, he says. And it gives you an edge over the competition. Lots of people are ignoring the methods that mentors can teach you. Click here to learn how to use big data in your digital marketing agency to produce an unbeatable ROI. If you’ve got to squeeze in a last-minute flight for your small business, you’ll want to avoid the week before Thanksgiving. In new research from Concur, the busiest days for business travel this year will be Wednesday, November 15, and Thursday, November 16. On these days specifically, you can expect long lines at the airports and even the possibility of getting bumped from an overbooked flight. Concur says the week before Thanksgiving, namely the second to last Wednesday and Thursday before the holiday in the U.S. is typically the busiest time for business flights. Last year, the busiest days were Nov. 16 and 17. But don’t think that traveling any other day that week is a breeze. The week before Thanksgiving is a busier time for business air travel than any other throughout the year. 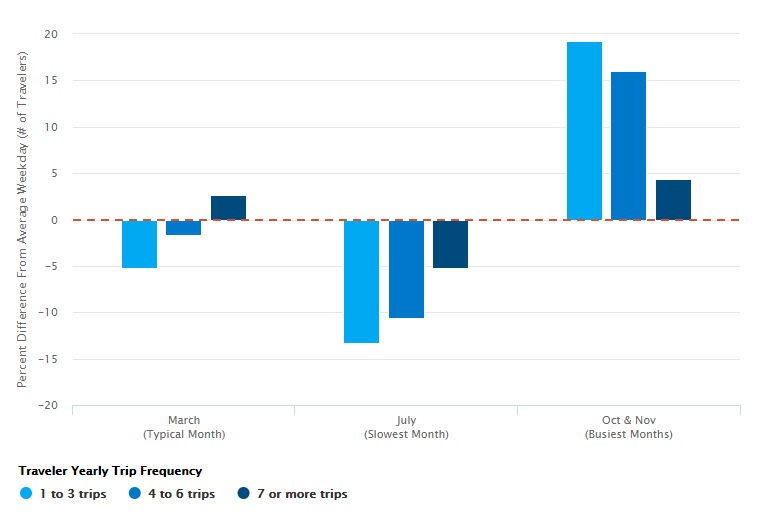 To arrive at this conclusion, Concur analyzed the amount of corporate travelers and compared each day against the volume on the average weekday. There are 58 percent more business travelers taking to the skies on those two days than any other throughout an average work week. And not only are there a lot more people on flights. Many of them will be relatively inexperienced travelers too. That’s likely to lead to more delays. Though it’s too late this year, it’s best to know the least busy travel time for businesses is July. If you’re still planning to take that last-minute trip this year and can’t avoid a flight the week before Thanksgiving, it’s best to book very soon. Concur found that flight ticket prices jump 44 percent higher if they’re booked within 8-14 days of the flight. What else are we here for if not to live our dreams? “From Breakdown to Breakthrough: Forging Resilient Business Relationships in the Heat of Change” is your guide to creating a team that survives an unpredictable future that is growing more unpredictable by the day. This book looks at the underlying dynamics that turn tension into conflict or resilience. It shows readers how to gauge that tension and leverage it properly to achieve a higher level of performance. Dealing with the conflict that naturally occurs in a business requires balancing the right amount of stress. If the relationships in your business slide too far to the extreme (either too much or too little stress), your business is at risk of becoming unproductive. From Breakdown to Breakthrough: Forging Business Relationships in the Heat of Change was designed to help leaders gauge and “course correct” the relationships in their workplace. By stepping in at the right time, leaders can help their teams reach a whole new level of performance beyond what they ever thought possible. What is From Breakdown to Breakthrough About? Why do some businesses rise triumphantly above an organizational crisis while others crash and burn? If you ask Michael Papanek and Dr. Liz Alexander, authors of From Breakdown to Breakthrough, part of the answer would involve relationships. No matter what business strategy or technology your business uses, it will not succeed unless you have the right relationships. Things will not move forward unless people know you, trust you, and act on what you say or do. Most business owners aren’t trained in this way. Business owners are taught how to create a business plan, how to hold a meeting, or which strategy to use when a competitor changes a price. Business owners aren’t trained to handle a situation where the accounting department refuses to talk to their sales department because the managers of each department hate each other. Business professionals aren’t trained to deal with supervisors who refuse to entertain any alternatives to their decision. As a result, business leaders either run from conflict or let it spread because they don’t know what to do. Both of these reactions (running away from conflict or ignoring the consequences of conflict) rob managers of the resilience available in the midst of crisis. As every business knows, sooner or later, you will face a crisis. It is at these times, when things break down, that you must rely on relationships to help you make a breakthrough. From Breakdown to Breakthrough, helps leaders and business professionals understand the dynamics behind all of this. It then helps them apply the principles of resilient business relationships to their current business relationships so they can reach a new level of performance and connection beyond what they ever expected. The book’s authors know a thing or two about dealing with business relationships. Papanek is a speaker, writer, organizational change consultant, and executive coach. He is also the founder of Michael Papanek Consulting. Alexander is a consultant, author of twenty non-fiction books (and a novel) in addition to serving as a contributor for Fast Company and Psychology Today. What Was Best About From Breakdown to Breakthrough? The best part of From Breakdown to Breakthrough is the simple approach Papanek and Alexander bring to the highly contentious issue of workplace conflict. This is something that many leaders are afraid to confront because it can be uncharted territory. Many leaders want to avoid conflict. They don’t want to use it to reach a new level with their teams. This book shows why it’s so important for leaders to leverage the powerful potential that lies in the tension of the workplace. From Breakdown to Breakthrough does an incredible job of analyzing a complex topic, workplace conflict, and transforming it into something that actually seems manageable. The book treats conflict as something that can be leveraged for greater gain, not something you need to eliminate. That mindset is the strongest part of the book. Still the majority of the book’s focus remains on workplace conflict at an individual level. More discussion about the ways leaders can leverage workplace conflict on a larger scale might be helpful. There is some information, but this can definitely be expanded further. Why Read From Breakdown to Breakthrough? From Breakdown to Breakthrough offers a unique perspective on tension and workplace conflict. Normally, conflict is something businesses want to avoid at all costs. Conflict and tension will never leave a business, so running is a strategy doomed to fail. Instead, this book argues businesses can stand up to conflict. They can prepare. They cannot predict the type of conflict they will face. However, they can invest in the relationships that can become a key asset during a conflict. Using this book, readers will learn the dynamics that transform average workplace relationships into something able to thrive in a crisis. Music can help you get into a “flow state” — losing yourself in the task at hand. Even repetitive tasks or mundane assignments seem more bearable, or even fun, when your favorite tunes are in your ears. Plus, your eyes won’t be so prone to checking the time. Is strategy holding your business down? It’s supposed to be lifting your business higher! If that isn’t the case for you, your business may need to consider one book before they call a strategy consultant. Written by a strategy consultant with global experience, “Making Big Decisions Better: How to Set and Simplify Business Strategy” should be that book. This book breaks down the components of strategy down to a process optimized for your business. Business strategy is one area that should be simple. All you have to do is pick your business goals and follow through. Yet, businesses struggle with this very simple process. This failure happens, despite consultants, magazines, articles, courses, workshops and SlideShare presentations. But why? Tim Lewko’s book, Making Big Decisions Better: How to Set and Simplify Business Strategy points the figure at a very simple answer. His book argues that we don’t understand what “strategy” really means, so we don’t know how to do strategy. Making Big Decisions Better shows how to correct this problem. What is Make Big Decisions Better About? Lewko’s book starts with a very simple question. But a very simple question can often lead to radically different answers. The question Lewko asks? What is strategy? Go ahead and ask this question in your workplace or business. You are guaranteed to get different answers. These answers reflect the different perspectives people have on exactly what strategy is and how it is used. If you believe that strategy is “stuff we do once a year at the annual retreat”, your planning may ignore the day-to-day steps implementing a strategy can entail. If you view strategy as a one-time event rather than a process, you might stick to a failed strategy because you didn’t take the time to look for alternatives. The different definitions can become expensive for businesses. After all, they spend money on consultants, new software tools and courses to help implement these strategies. And when a strategy fails, businesses lose not just the money invested — but customers, potential profits and employee morale. In other words, businesses endanger not only their productivity now but potentially in the future. Unforunately, businesses can’t fix failures of strategy with more strategy. Instead, Lewko claims, teams must better understand what strategy is in the first place — and what it can do. They instead rely on assumptions, tradition and the best practices they copied from others to make their strategy. Making Big Decisions Better asks readers to step out of the same old processes everyone else follows and reflect. In doing so, they will find out that strategy is not as complicated or boring as it seems. Lewko is the CEO and Managing Partner of the Thinking Dimensions Group. In addition to that role, he serves as the Managing Director of The Global Strategy Practice. What Was Best About Making Big Decisions Better? The best part of Making Big Decisions Better is that it dramatically simplifies the concept of business strategy. Once readers grasp this concept, the book guides them into dismantling the hidden assumptions and mindsets that block people from an effective strategy. If you have ever wondered “Why is our business doing things this way?”, “Making Big Decisions Better” will guide you through the process in the same way an expert consultant would. If you want a consultant’s insight without having to pay a consultant, this book can definitely serve as an inexpensive option. Making Big Decisions Better does an excellent job of breaking down the concept of “strategy” to its most basic and useful level. The perspective and intended audience for the book –upper management in mid-sized and large-sized businesses — seems very narrow. This makes some of the book’s content either irrelevant or confusing. That said, the book still provides excellent insight into the underlying assumptions about business strategy many business leaders overlook. For this reason alone, the book is worth a read. Why Read Making Big Decisions Better? Strategy should be one of the easiest topics for a business. However, it’s become abundantly clear this is not the case. In fact, a business’ strategy can become an obstacle. And the solution to this problem is not what you might expect. As Making Big Decisions Better points out, the problem (and solution) might be a lot simpler than you think. The problem may not have to do with the strategy you use. It might be about the way you use the concept of strategy in the first place. Making Big Decisions Better helps readers uncover and correct the underlying assumptions that block businesses from the strategies they deserve. Remember, Steve Jobs wasn’t an overnight success.